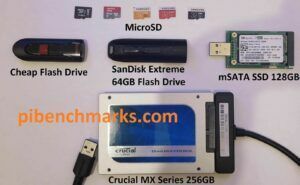 Benchmark Your Raspberry Pi MicroSD Cards – Fakes Everywhere! For the past couple of weeks I have been putting together a Minecraft 1.12 Raspberry Pi Guide and have been using my several year old Samsung Evo 32GB cards. After reading several blogs and benchmarks I decided to purchase some Samsung Evo+ 32GB cards off Amazon because they benchmarked better than my orange Evo cards I already have. Let me start out by saying I love Amazon and am a Prime member and buy almost everything there. I bought two Evo+ 32GB cards from Amazon and received them very quickly as usual. However, once I started using them, I figured out that they were either fake or Samsung had revised the model and it performed terribly. I don’t just mean slightly underspec bad either. I mean worse than my Walgreens ghetto off the shelf cards I bought on clearance! 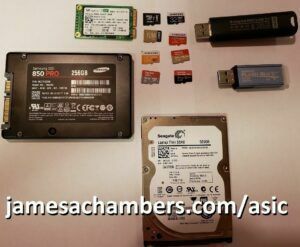 In this article I’m going to show you how to benchmark your SD card on the Raspberry Pi, and I’m also going to include how to use a popular utility to benchmark them on Windows if you don’t have a Raspberry Pi.